Not content to be just the most challenging of the crop of groups reworking dance-punk, Liars -- now consisting of founding members Angus Andrew and Aaron Hemphill and new recruit Julian Gross -- redefine their radical aims on They Were Wrong, So We Drowned. Taking inspiration from the tape-loop experiments of This Heat and the finely chopped electronica of Matmos, the Liars also draw upon the legends surrounding Walpurgisnacht, the date in German folklore when witches fly to the Brocken mountain and perform rituals that coincide with spring's victory over winter. The result is an album that, from its witch-hunt alluding title to its songs, is a riveting exploration of the dangerously seductive power of fear. Making full use of the political potency of its metaphor, They Were Wrong, So We Drowned depicts the struggle between a village of Christians and the women they believe to be a coven of witches, alternating their sides of the story track by track. According to Walpurgisnacht legend, one of the main remedies against the night's evil spirits is noise; after sunset, the boys of the villages near the mountains make as much noise as possible to drive away the witches and demons that emerge after being trapped in the earth during the winter months. Liars take this part of the legend to heart: They Were Wrong, So We Drowned is sculpted from layers of digital and organic noise that create a suffocating sense of dread. "Broken Witch" starts the album with ominous drones and stuttering drums that eventually fall into a grinding, nearly industrial rhythm. It's a deeply unsettling song, and not just because the shouted refrain "blood, blood, blood" is one of its few immediate hooks. But as challenging as the track is, it's only Liars' opening salvo: as it unfolds, They Were Wrong, So We Drowned gets progressively darker, denser, and stranger. The first time through, its mix of crushing noise and eerie negative space is equally exhilarating and bewildering, and in many ways, the album is thoroughly disorienting: its juxtapositions of modern sounds and processes, centuries-old legends, and ageless emotions create a thought-provoking cognitive dissonance. Likewise, the album's electro-noise-prog hybrid is as much of a departure from They Threw Us All in a Trench and Stuck a Monument on Top as that album's smart, angular rock was from most of the work of Liars' contemporaries. Aside from both having titles that tell stories from the viewpoints of the dead and defeated, the main similarity between They Threw Us All in a Trench and Stuck a Monument on Top and They Were Wrong, So We Drowned comes from "This Dust Makes That Mud," the lengthy, lock groove-like track that closes the debut album and seems to have colored the intensity of the follow-up. The tribal drums that make up the album's pulse on the musique concr?te-inspired "Read the Book That Wrote Itself" and the abrasive dance-punk of "There's Always Room on the Broom" have a lot to do with its relentless thrust, but the sounds surrounding the percussion are far from primitive. Co-producer David Sitek shows why he is a forward-thinking sound-shaper repeatedly on They Were Wrong, So We Drowned, particularly on "Hold Hands and It Will Happen Anyway," which pairs the prettiest melody on the album with savage guitars and more of those pagan drums. This song, along with "They Don't Want Your Corn - They Want Your Kids" and "They Took 14 for the Rest of Our Lives," injects dance-punk with some of the sense of danger that punk once had. By the time "Flow My Tears the Spider Said" turns from a brooding sea shanty into a desert island of chirping birds and mysterious clanking noises, They Were Wrong, So We Drowned proves itself to be more like a force of nature than a proper album. 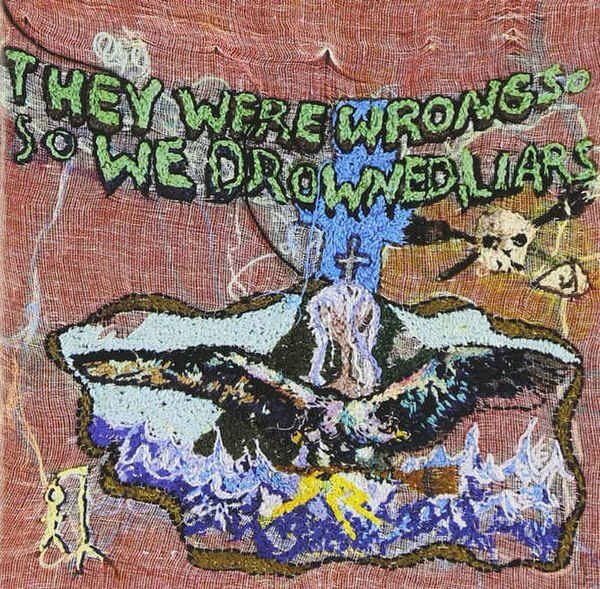 By not just defying but denying the expectations about what their music should be like, Liars have created one of the most fascinating, confrontational albums of the 2000s.